Thank you and goodnight, Arthur Chu. 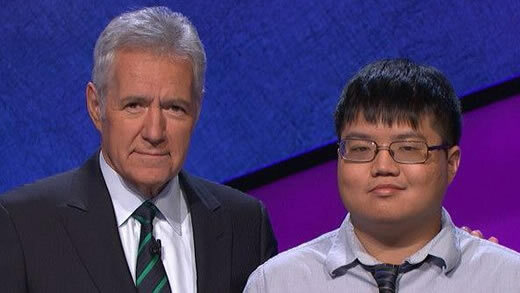 Arthur Chu’s controversial Jeopardy! winning streak has ended. Arthur came in third on Wednesday’s episode with zero dollars, ending his 11-game winning streak, and going home with a total of $297,200 in winnings. During his time on the show, Arthur attracted a lot of criticism for his Forrest-bouncing, buzzer-banging, Trebeck-interrupting strategy… but he certainly had a clear, well thought-out strategy. Here at www.howtowingameshows.com, we applauded Arthur’s methods. It’s always a good idea to learn as much as you can about the show you’re planning to go on, before you go on it. The information’s all out there. Do your homework. It just might give you the edge! It certainly did for Arthur – well, for 11 games anyway. Congratulations Arthur, and enjoy your $297,200! This entry was posted in 'Jeopardy', Game Show Winners, Strategy, Tactics, Updates by Stephen. Bookmark the permalink.